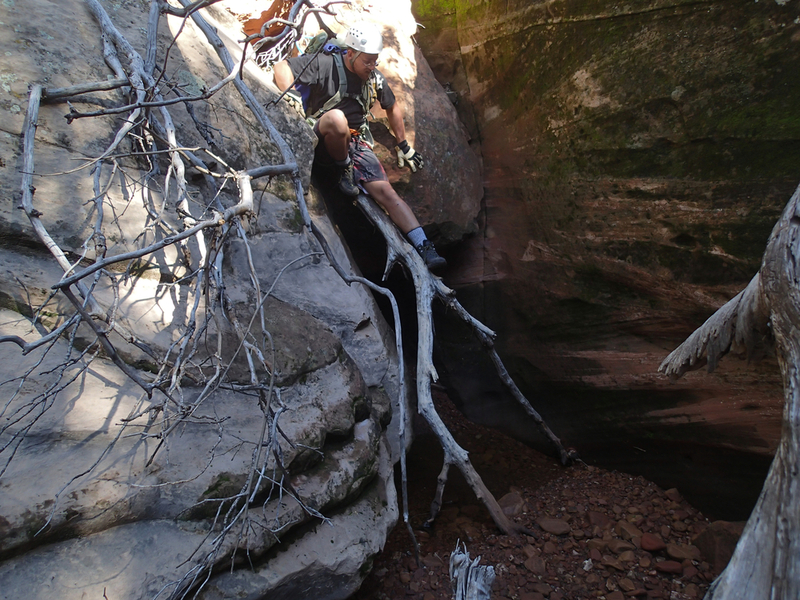 Mormon Canyon, AZ - Technical canyoneering description, location, GPS route, photos, topographic map, and weather information. 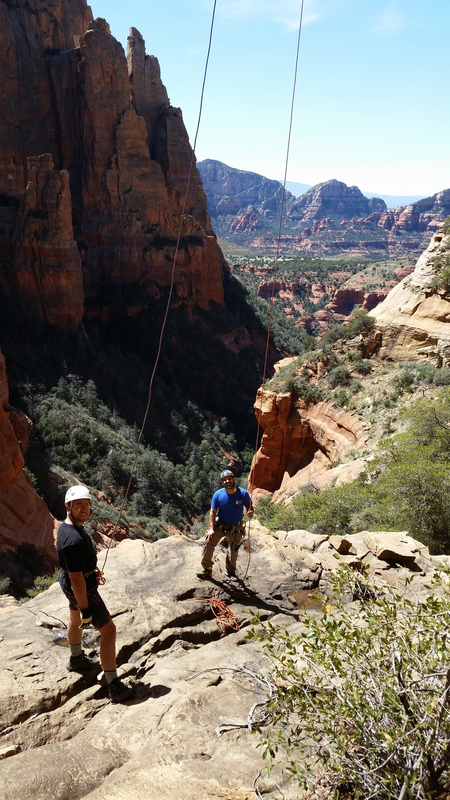 Mormon canyon in Sedona, AZ lends itself to fairly easy access to 4 rappels with the highlight being a large free-hanging drop with some great exposure "The Magnificent Mormon Monster". The trip starts at Midgley bridge and ends at the Mormon canyon parking area located at the end of Park Ridge Road. Setting up the shuttle is quick and easy with the road being suitable for vehicles of any size. Starting from Midgley bridge, you immediately begin to gain elevation as you take the trail on your right hand side following the signs to the top of Wilson Mountain. Its roughly 2 hours to the drop in point give or take based on your speed. The views from this trail are great throughout the hike up, and is most likely best completed during times of cooler weather as many spots are exposed to direct sun. You soon find yourself working up a short section of switchbacks through a rocky band on your way to a tree lined section just prior to the north canyon overlook trail. 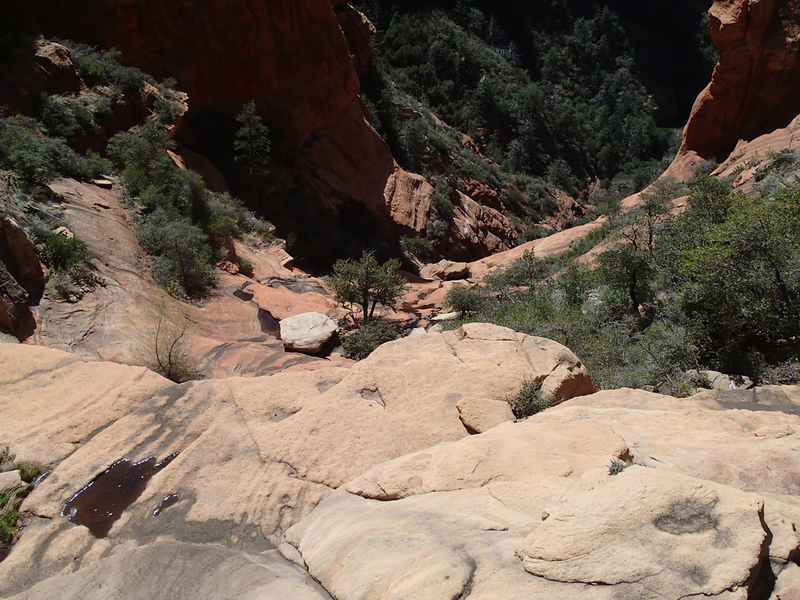 Once on the overlook trail, its a short walk where you can begin to work your way down into the heart of the canyon. 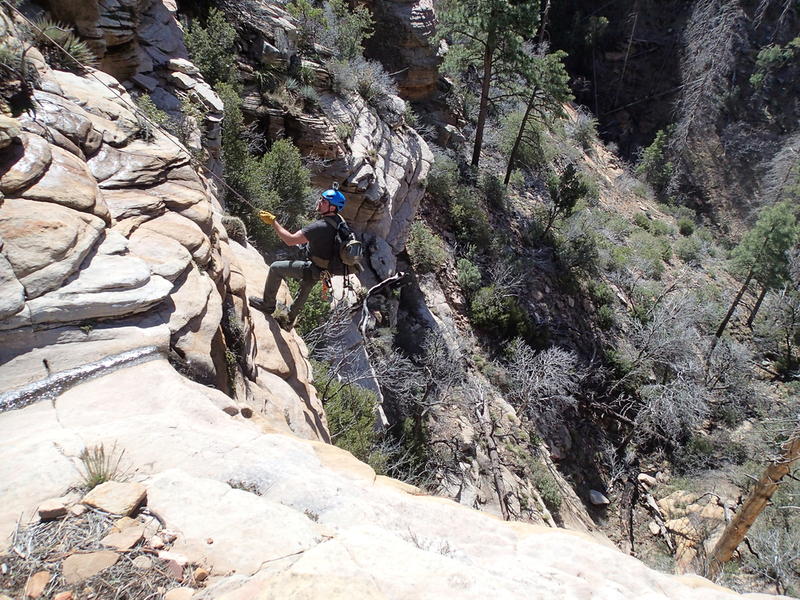 Bypassing a short drop and continuing down stream, you will soon find yourself at the top of the first rappel requiring up to 120' of rope (approximately 80' will get you to the shelf below where you can then down-climb, the 120' will simply take you to the bottom). From this point on the canyon is fairly straight forward and you may notice many seeps along the walls that begin to get the stream bed flowing as you work your way down. During this section a drop or two could be set up if desired, but all obstacles encountered were quick and easy to bypass. Moving forward you can tell there is something big ahead as the enormous canyon walls in the distance come into view and the edge begins to drops off. Several trees up top make great anchors, but they are well back from the edge and could easily eat up 100' of webbing if you go with redundant loops off two trees. During our trip this webbing was run out a long way in an effort to get a little closer to the edge, use less rope, and have a smooth pull. If this webbing is shortened, it could easily add 20'-30' to the required rope length. The "R" rating above could be suggested due to the large drop along with a rub point near the lip that we noticed trying to eat its way through a brand new rope. This edge issue should not be overlooked and was easily solved in our case by simply changing the rub point, although many other forms of rope protection would do just as well if not better. Just beyond the landing zone for this large rappel, the canyon continues to drop off steeply giving the feeling that you are much higher than the 300' of rope would suggest. 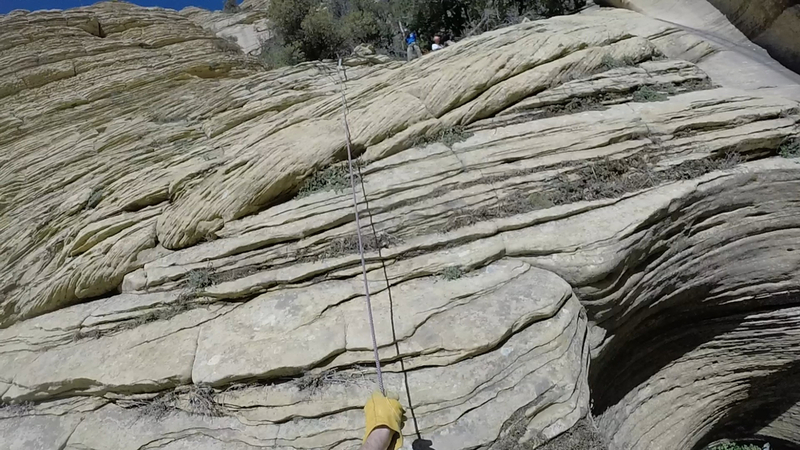 Once down and the big rope is managed, you begin working your way down canyon towards the next drop. Soon you will be at a sloped section of rock that may be down-climbable, but we set up a quick anchor where a short rope easily gets you down the slab and on your way. 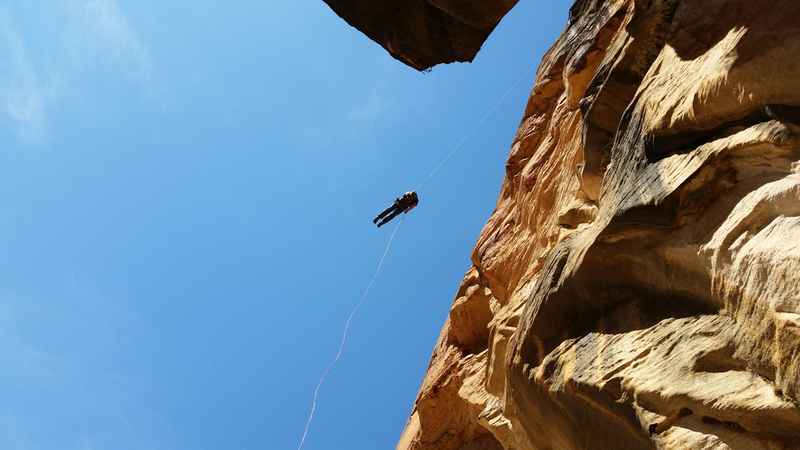 Withing eyesight you come across the final rappel of about 135' starting into a crack and ending with a short free hanging section. From here on its your basic creek walk back to the parking lot. 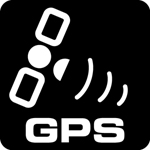 You will notice on the map that once a certain point is reached, you are basically paralleling a well groomed trail and its possible to punch through the brush as desired and make your way back.